In this episode, I discusses some challenges facing American Muslims in a Trump presidency. I also addresses the need for Muslim activists and scholars to work with one another, not against, and how can American Muslims work to restore their sense of dignity and respect in the eyes of society, and most importantly, God? Continuing in that vain, I want to share a letter by one of my dearest friends, Dr. Muhammad Khalifa. I have known Dr. Khalifa since I first became Muslim and his friendship and voice have remained bastion of sanity when the world around me seemed quite the opposite. As a disclaimer, I am posting this not to demonize CAIR in particular, or to, as I also said, “draw ideological lines in the sand”. Rather I say this to demonstrate the urgency for us to focus on oppression at home, especially when it is a form of oppression we can put our hands on. And to Allah belongs all the praise. I write this letter to reflect on CAIR’s response to the killing of Michael Brown. By several eyewitness accounts, Brown was an unarmed Black teen who, while waving his hands in the air yelling, “I don’t have a gun,” was shot and killed by a Ferguson, MO police officer. While I applaud CAIR’s willingness to support this issue, I write this letter because I carry a heavy heart and imbue deep disappointment with CAIR’s approach to issues of oppression, racism, and social justice in the U.S. Muslim community. The encouragement to give a Friday sermon to address this issue is far too little, and too late. In fact, without a more concretely sustained response to racial injustices in America—particularly those that impact Blacks, Latinos, and Indigenous Americans—CAIR’s response seems not only reactionary, surfaced and sensational, but even opportunistic; if the latter were true, what easier way to exude an image of standing for racial and social justice, than to encourage a khutbah on the heels of Michael Brown’s killing? It allows one to continue to focus on their own agenda, without appearing to hypocritically ignore even more palpable issues of oppression confronting other minoritized Muslim Americans. It is safe, easy, harmless, and doesn’t require the types commitments and sacrifices of, for example, those like Andrew Goodman, Michael Schwerner, Julius Rosenwald, and Louis Isaac Jaffe—other non-Blacks who fought and died because they saw this as apart of their own struggle toward social justice. It is really quite irrefutable that Black men are of the most oppressed groups of men in the U.S. In my field of education, this oppression is perhaps most palpable: even after disciplinary offenses were equally discovered by educators, Black males nationwide were still four times (4x) more likely to be suspended than their White counterparts. This, of course, contributes to being pushed out of school (as opposed to being blamed for dropping out), and ultimately to what we researchers refer to as the school-to-prison pipeline. What emerges from this, and other research from scholars such as William Julius Wilson and Tyrone Howard, is an extensive regime of oppression toward Black men in America. Black male oppression, in all honesty, may very well be the single most virulent form of oppression in the U.S. today. Now, where is CAIR on issues like that? In consideration of these more intractable realities, in other words, it seems as though CAIR is missing from the front, and has preferred more media-frenzied and popularized responses to singular incidents. And if my perceptions are wrong and they are indeed fighting such battles, few of us have actually seen them in the racial battleground circles where they occur. I understand the religion of Islam to be anti-oppressive. I also understand from my Islamic teachings that when being anti-oppressive—whether fighting illness, poverty, ignorance, or racial oppression—one must begin by acting local. I remind my brothers and sisters at CAIR that Black Muslims in the U.S. comprise over a third of U.S. Muslims. Yet, they have far fewer opportunities than their foreign-born and second-generation coreligionists. It is not the fault of these Muslims, but when will their (i.e. Black and Latino) issues be re-centered in national discourse around social justice? For, given the bleak statistics around Black males, they are far more likely to be oppressed because of their gendered race, than their religion. Of course, I do not claim that CAIR supports racism or oppression of any type; nor do I lay this responsibility totally at the feet of CAIR or like organizations. Rather, probably because of their own histories and lack of awareness of how oppression operates, morphs, and is reproduced in this context, I claim that they are unfortunately slipping into a posture of what researchers refer to as post-racial—in this case, the use of discourse that is so broad and void of specific critiques of racism, that the critique itself serves no purpose and may even do more harm than good. 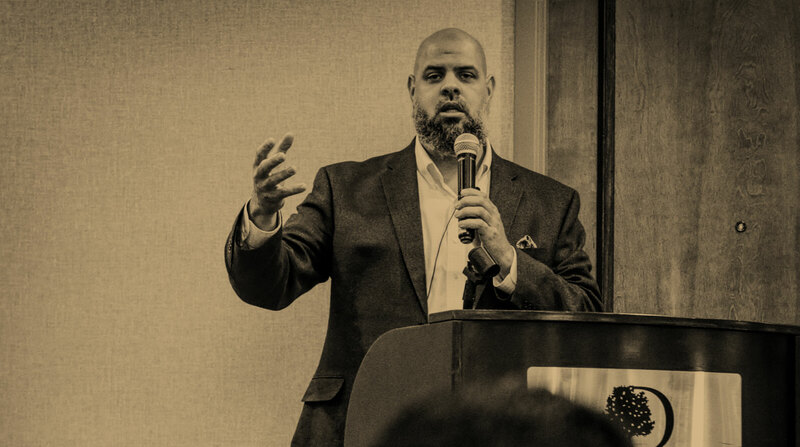 Executive Director Awad’s statement, “Despite progress in race relations over the past decades, our nation still has a long way to go to live up to the true American values of equality and justice for all,” is a testament to this fact, and implicitly confirms the following sentiment: CAIR will mention it in the broadest, safest, most general and impotent way, and will make no mention of the specific abominations facing daily life for Black males; CAIR will not really take up this issue, but wants to appear to be taking up this issue. Will you not mention his name (Michael Brown), resist, agitate, or even center his story, except in ways that are palatable in the popular American discourse and imaginative? In ways that are comfortable to you? I urge CAIR to confront microaggressive racism and institutional racism in the U.S. I urge CAIR to center the most salient local forms of oppression in their civil rights agenda, and these are tied to Blacks, Latinos, and Native Americans. I urge CAIR to not seek highly visible incidents that will bring notoriety, but then lack a sustained agenda to confront the contexts that brought about the oppression. But also I urge CAIR to invest in the policy-level conversations that can impact policies that impact the daily lives and opportunities of Black males. And I finally urge CAIR not only to link with the NAACP, the ACLU, the NOI, and Urban League, but also with the grassroots, smaller, advocacy and community organizing agencies found throughout urban America. Without such emphases and alliances, you may loose the fight of credibility and relevance in this context. Many of us have travelled throughout the Middle East and South Asia, and we have seen firsthand the treatment of Blacks and other expatriates in these lands. When you come to the U.S., and then primarily focus on issues that confront Arab and Asian peoples, you really suffer a devastating blow to your own organizational credibility. As I conclude this letter, I do so with deep conflict and consternation. I come from a family in which I am one of the only Black men who has not been jailed or imprisoned for a period of time. I sit today, in fact, as the only non-imprisoned male child from amongst 2 other brothers with whom I was raised. I am conflicted not because we need the help of CAIR, for this conversation is far broader than that. Afterall, we Black, Brown and Red, folk have been resisting for centuries, will do so for many more to come, and will do so in ways far more culturally responsive than what organizations like CAIR or MPAC might bring. But I am conflicted because letters like these have all too often fallen on deaf ears, and as they have, so too have the such Friday sermons fallen on my own deaf ears. I, and my people, need relevance and we detest hypocrisy. So too, is it, that the people who claim to represent my faith and civil rights, have an agenda that is not relevant for the civil rights in the daily lives of Black men. This conversation is broader because I see my fellow Muslim leaders becoming even more out of touch, and so too are the masses that follow. Finally, please do not seek prominence, moreso than you would even seek justice. Yet if you shall continue to do so, then please, leave the legacy of Michael Brown to the honor, dignity, and esteem that it deserves. Join us at the Sixth Annual Dinner and Fund Raising Banquet for CAIR-Philly on March 10th, 2012. The event will be held at the Springfield Country Club in Springfield, PA. Prior to the start of our program, there will be a 90-minute reception with complimentary drinks and hors d’oeuvres to provide guests with the opportunity to socialize, network, and visit vendor exhibits. Speakers for the evening include Dr. Sherman Jackson and Imam Siraj Wahhaj. Entertainer Michael Harrison will also perform. Learn more our speakers and entertainer. We also have a very special and fun-filled program in place for the children. In addition to our speakers and entertainment, as supporters of CAIR, you will be updated on our many accomplishments over the last year as well as our future plans for the upcoming year. We are working hard to make this an exciting and fun-filled event for the entire family. We hope you come out and share this wonderful evening with us. Your attendance will affirm your confidence in CAIR-PA as a leading Muslim organization advocating on our behalf to help create an improved environment for us and our children. If you are interested in co-sponsoring this event by having an exhibit or advertising in our program booklet, please contact us at 215-592-0509 or e-mail us at info@philadelphia.cair.com to make arrangements. I am re-posting this from a letter my wife wrote about the 20/20 incident. After lengthy discussion about ABC’s recent 20/20 program on an email listserv for Middle East and Islamic Studies, Maytha Alhassan invited members to compose a letter to the producers. We have workshopped the letter with someone in the media and incorporated suggestions from readers. If you are interested in signing, please send your name, title, and affiliation. We applaud ABC’s 20/20 for producing the show “Islam: Questions and Answers” program, which attempted to address the American public’s curiosity about Islam and show the true face of Islam in America. However, as scholars, activists, educators, and community leaders, we are concerned about the ways in which this program misrepresented Muslim Americans. We would like to address three major areas where your program inaccurately depicted Islam in America: first, by continually asserting that moderate Muslims do not speak up; second, by overlooking the contributions of African American Muslims; and finally, allowing women who have complete antipathy towards Islam (Pamela Gellar and Ayaan Hirsi) to speak for Muslim women. The producers and researchers may have been well meaning, however the program’s insensitivity and lack of nuance alienated many American Muslims and perpetuated many misconceptions about American Muslims. Our aim is to address these three areas and provide some recommendations for more accurate coverage of American Muslims in the future. It is problematic to divide Muslims into binary categories of “moderate” and “radical.” Would the same categorical statement be made about the socio-political orientation of followers of different religious faiths and other ethnic groups? How would the mainstream reaction to your program be had you produced a segment titled “Where are all the moderate Christians?,” “Where are all the moderate Latino Americans?” The framing of these questions and methodology of answering these questions highlights an acceptability of a bigoted stance on Muslims that is rarely acknowledged. Muslim Americans are constantly blamed for not speaking up, however the media bears some responsibility. Moderate Muslims continually speak out and do positive things for American society, but this does not make it in the news. And there American Muslim scholars and leaders who hold conferences, talks, lectures devoted to the topic of “Forging an American Muslim identity.” Zaytuna Institute scholars Hamza Yusuf and Imam Zaid Shakir, Islamic Center of New York University Imam Khalid Latif and professor Dr. Sherman Jackson are but a few of the many American born intellectuals and community leaders who do speak out. Where is the media when peaceful Muslims gather, participate in the American political process, protest terrorism, violence, and hatred? At one point, an expert posits a recommendation “They need to have a million man march on Washington,” while conveniently ignoring that the Million Man March was actually led by a Muslim man, Louis Farakhan. On September 25, 2009, Islam on Capitol Hill gathered an estimated 8,000 to prayer Friday prayers. And on October 15, 2010 thousands of Muslims once again convened on Capitol Hill to demonstrate their belief in American democracy and promote religious freedom, however, there were few media outlets at the DC event. Muslim Congressmen Keith Ellison wrote an Op-ed “Should We Fear Islam?” in the Washington Post speaking to the first point made in this section. Ellison and Muslim Congressman Andre Carson were also completely absent from the program, which brings us to an important issue of accurate portrayal of American Muslims. The program reinscribes Islam as a foreign religion by focusing on Arab and South Asian immigrant communities in the US, at the expense of African American Muslim communities. Your program excluded African American Muslims in the narrative of Islam in America and conflated of Arab with Muslim. African Americans make up the largest percentage of Muslims in America, and yet your program visited Dearborn, Patterson, NJ, and even Egypt to speak with Arabs who compose the third largest group of Muslims in the US. The Nation’s first capitol, Philadelphia, has a rich and long history of Muslims. There was a community of orthodox Black American and Caribbean American Muslims from the 1920s. It has high concentration of Muslims, a Muslim chief of police, Muslims who work in city government, etc. With the over-exposure of Arab Muslims, your program even failed to mention that Arab American Muslims are in the minority in Arab American communities. Most Arab Americans are Christian. The program did a poor job discussing, engaging with and highlighting the diverse community of Muslims. Low figure for Muslims (2-3 million? ), and no breakdown of the demographics. The program even failed to show celebrated athletes (NFL, NBA, boxing, Soccer players), politicians and historical figures who are Muslim and African American. Finally, the segment, “Does Islam oppress women?” did a great disservice to Muslim women. While we appreciate the inclusion of one Muslim voice, Irshad Manji, she herself is not a scholar on Islam. Instead two polemics who are vehement in their anti-Islam stance, Ayaan Hirsi and Pamela Gellar received undo attention. Your program failed to include any Muslim scholars such as Amina Wadud, Ingrid Mattson (a Canadian scholar who recently ended her term as ISNA president), or Dr. Aminah Beverly McCloud to speak in this segment? Their and other scholars’ absence is an indication of an asymmetric representation of opposition views. Perhaps these scholars would have shed light on Muslim women’s contributions through history such as Islam’s first convert, Khadija al-Kubra, the Prophet Muhammad’s wife, who was also his employer before marrying. One of the first Sufi saints was a woman, Rabia al-’Adawiyya al-Qaysiyya (Rabia al-Basri) or Nana Asma’u, a West African educator and reformer. Explore the long history of Muslims in the US, a history of residency and settlement that predates the formation of America as a country. American born Nawawi scholar Dr. Umar Faruq Abd-Allah has written extensively on this subject. Include broader segments of the American Muslim community to ensure that each major ethnic group, South Asian American, African American, and Arab American, is represented in your programs. Attend Muslim American events, banquets and conferences like the prayer on Capitol Hill, MPAC, CAIR’s functions, etc. Do not just focus on sensationalism, but cover American Muslims during Ramadan or Eid al-Adha (the end of Hajj). We ask your researchers and staff to be more careful in their selection of “experts.” Make distinctions between socio-politics and Islamic scholarship. None of the women you interviewed in the question on the oppression of women in Islam had training in Islamic scholarship on covering or the hijab. We can help provide a list of scholars and experts who would be happy to lend their expertise. Consider diversifying your staff, researchers and interns with knowledge, expertise, and experience in various communities may yield better results. In summation, your program provided a rare opportunity to provide accurate coverage of Muslims and clear up misconceptions. As acknowledged at the onset of your program, the controversy surrounding the Park 51 community center elicited a renewed curiosity in Islam. We were pleased with the inclusion of Edina Lekovic’s (MPAC) comments, Reza Aslan’s explanation of the definition of “fatwa,” and Faiza Ali’s (CAIR-NY) elucidation of the hijab’s complex historical place in cultural and religious practice, “coerced headcoverings are tribal.” However we note that while your program was a step in the right direction, it still ended up being misleading. By taking into consideration the recommendations we have made, your producers can create more accurate programing on Muslim Americans thereby showing the real face of Islam in America. The immigrant leaders believe they own Islam in America and we the “African Americans” are just the poor of the religion. We have to tell our own story and do our own documentaries. No one cares about us or our story and contributions to America and Islam, if we don’t. I am always disappointed at programs like that, but never surprised. African Americans need 2 tell they own story we need 2 stop depending on these people 2 tell our story…we must do our own reports…documentaries..
Bottomline, you cannot do a documentary on Islam in American without interviewing the African American. The the question need be asked what would the reaction be if we told the Story of America and omitted Christopher Columbus, George Washington or Thomas Jefferson??? It’s not about whining it’s about telling the truth and presenting it accurately. If ABC came to CAIR then CAIR had a responsibility to make sure they aired a fair an accurate depiction. So none of those “so-called” scholars said to to the ABC execs you must include African American Muslims in order to have a complete picture of Islam in America? They (the Muslim consultants and don’t believe for one second there weren’t do…zens) didn’t see how by not doing so it perpetuates another falsehood about Muslims in America being immigrants or the children of immigrants? Wasn’t the program’s intent to dispel falsehoods about Muslims in America? It’s frankly insulting!!!!! The Council on American Islamic Relations (CAIR) and all the rest should absolutely refuse to do these exposes on Islam when they delete African American Muslims the way ABC did! Shame on them & ABC. As can be seen here, the anger and frustration runs the gamut. The question remains: how will CAIR address this issue and how will Blackamerican Muslims seek to engage, and if possible, reprimand CAIR for their systematic dismissal on the public stage? But perhaps more important than all of this is the lesson to be learned here: it has been high time for Blackamerican Muslims to take their rightful place in leadership of Islam in America. I do not believe this to be the case out of some misguided sense of racial pride or nationalism, but in actuality, rooted in a form of pragmatism: Blackamericans are one of only two possible racial categories in the United States that are seen as unassailably American. And being that Blackamericans comprise the only racial/ethnic group in America that have embraced Islam in significant numbers, it only makes sense to help foster and develop Blackamerican Muslim leadership. To do otherwise or to work towards the opposite goal [which in many ways is precisely what CAIR helped to do in the program], resulting in a dereliction of duty and jeopardizing the future of indigenizing Islam in American. Every [sic] since the children of Africa were brought to this country and came in touch with the Christian religion, we had to figure out some way to come to terms with what white Christians were teaching about religion and what they were doing in their social, economic, and political lives. It was clear to many African Americans at the very outset that the Christianity they were being taught could not be accepted on the terms that slave owners were presenting it because slavery itself was a contradiction to Jesus’ call to love each other as we love ourselves. As is so often the case with reminiscences, the nostalgia may grow more out of a sense of frustration and powerlessness than out of any true appreciation of the meaning of the past. But as the reminiscences continue a veil seems to descend between then and now. The tellers of the old tales label the veil Black Power, and pronounce ritual curses on Stokely Carmichael and Floyd McKissick and their followers. The trouble with these meetings is that they are indeed becoming ritual, cultic acts of memory that blind us to creative possibilities. Because that “veil” may be a wall, not primarily for separating but for writing on – both sides of it. Or it may be a great sheet “let down from heaven”; or a curtain before the next act can begin. Most of us appear totally incapable of realizing that there may be more light in blackness than we have yet begun to glimpse. The Black Power Revolt – A Collection of Essays. Ed. Floyd B. Barbour. 20/20 – What Is Islam? Questions and Answers. Black Power and the American Christ, by Vincent Harding.